Anyone care to comment on his take? It is not a joke? The person seems to have ignored a lot of real world knowledge, such as physics and basic earth sciences in the creation of his hypothesis. He seems to have been reading Ward's ideas on the Jupiter System of Force or something. He just keeps coming back for more, though. I asked if there were any peer-reviewed journals he'd given this info to and he stated that 'conifidentality' meant I'd have to wait. Until I read from climate scientists regarding his theory, I'm not inclined to put much into it. Is this 'missing heat' a red herring the denigelicals have seized upon because it sounds comforting to them? Basically: has the missing heat been successfully accounted for? Knox and Douglas - see summary. This is a particularly significant recent paper - critical of Trenberth and the models. All should read. In fact, it completely debunks the models, meaning the predictions regarding CO2 are incorrrect in their entirety. If you have any comments I will respond to personal emails if written in non-offensive tone. Doug Cotton B.Sc. (Physics), B.A. (Econ), Dip.Bus.Admin. 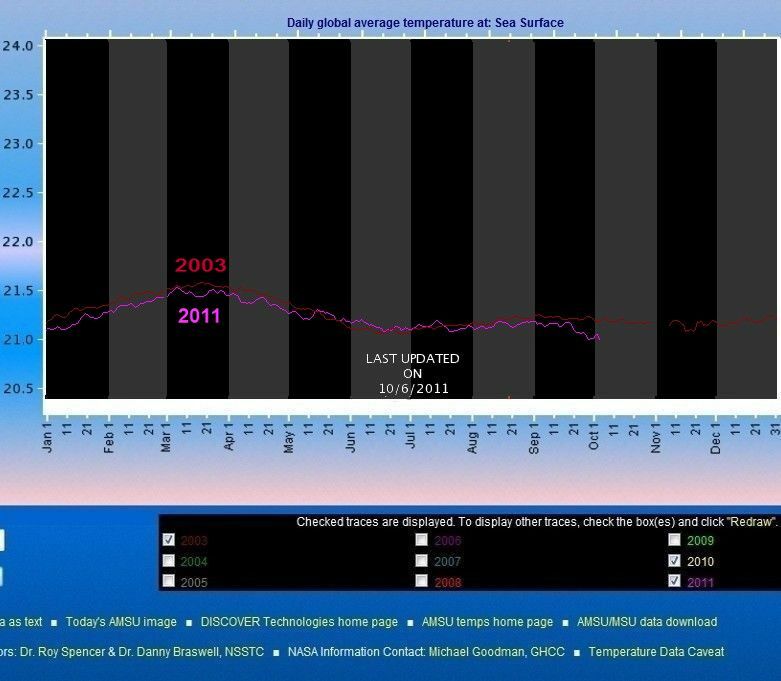 Note that the Trenberth chart (below) shows increases, so even when the ocean heat line is going down after 2005, ocean heat is still supposed to be increasing - just at a slower rate. Knox and Douglas said this would make the missing heat even greater if it actually existed. They deduced that it does not exist at all and that the models were thus totally incorrect in calculating a large net radiation. In fact, then, since 2003 the world has been cooling (though the margin of error just creeps into the positive) as I have been saying from the NASA data - long before I found the Knox and Douglas paper. The main point is that, with the highest levels of CO2 in modern times the IPCC models were way out. The empirical data shows they should have calculated a slight net outflow of radiation. Now show me any recent papers that take into account 2010 (and preferably 2011) data and yet show otherwise. You do realize the over-generalization in presenting what is supposed to be science negatively impacts your credibility? The leap of faith from "debunking" models to claiming one paper therefore changes the laws of physics and overturns over a century of research by countless scientists when you say "meaning the predictions regarding CO2 are incorrrect in their entirety" you have lost much credibility. The paper is a bit recent to have a good indication of what the scientiific community thinks of it through the citing in other papers, so the 5 cites listed for it under Google scholar is not sufficient to draw any conclusions. The slightly less recent papers mentioned in the rebuttal, J. M. Lyman et al., “Robust warming of the global upper ocean,” with 25 citations and K. Trenberth and J. Fasullo, “Tracking Earth’s energy,” with 29 citations do seem to be more highly received at this point. Of course, 2 cite for each is this rebuttal, but 24 and 28 are still respectable references for such recent work. A first semester chemistry major worth their weight in plastic molecular models could tell you what poppycock this is, Iowa. Errors and biases such as this? A part of the global Argo data are subject to biases in reported pressures. These biases are usually less than 5db, but occasionally can be larger (> 20db). These bias errors are being steadily removed by the reprocessing of historical Argo data. 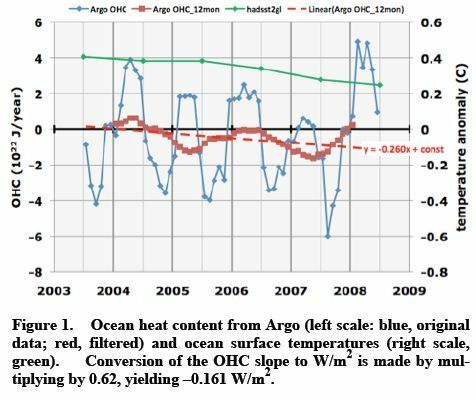 We expect that by the end of 2010 these errors will be removed from the global Argo data set in both the delayed-mode and real-time data. Adjusted pressure data are stored in the PRES_ADJUSTED variable, while the raw biased data remains in the PRES variable. Normally, Argo pressure data have an accuracy near 2.4 db after bias correction. A subset of Argo floats cannot be corrected as the pressure bias was not transmitted by the floats. Within this subset, some will have a high probability of developing large biases. These floats are identified in the delayed-mode processing of Argo data and are flagged with higher pressure errors (20db) in the PRES_ADJUSTED_ERROR variable. It may be related to the statistical plotting whcih is not tied to the fluctuation of the noise. Actually I prefer to use the actual sourced charts just because I have seen so many "interpretations" of data presented as if the paper actually provided the chart. I did not see a statistical confidence provided for this determination, which would be important for trend determination on such a short time scale. Cooling as in a trend or just a tick in the noise level? This is where your leap of logic really goes off track. The extreme over-generalization of this supposedly refuting everything regarding the effect of CO2 and by implication all other GHGs, really has no basis in fact. It would be nice to know if the data used from the ARGO floats in your paper were the corrected data and not subject to excessive bias error. Do you have any reference on that? Also a statistical confidence on the cooling trend would be nice to see. the alternative medicine focus is not always a problem, but is a flag for me .... also the technical college turned technical university, Swinburne University, lists no post graduate studies for natural medicine. Snowy, could probably do it as well. Speaking of snowy, where did he go? Thanx for stopping in and giving your side, Doug. I hope you stay a bit and post on this or any subject that catchs your fancy. Snowy? He's a student, remember: maybe he's on summer vacation or such. Could be, but it has been almost a month since his last post and school should be starting soon. Who was the one who said heat increase precedes CO2 increase?? Look, you can talk all you like about numbers of citations etc etc. Knox and Douglas are, after all, just bringing together the results of other studies, so you can always check the originals. This is not a numbers game. However you look at it, Trenberth's estimates of ocean warming every year since 2003 have to be wrong. I don't blame him - there was bad data. The sea surface figures would have to show it if it really happened. And we should be weighting mean world temperatures by about 90% on "over the ocean" temperatures, based on the heat stored, not the surface area of about 70%. Land measurements are also prone to urban crawl and other problems. Just keep watching those NASA sea surface figures. The main point is that the period 2003 to 2011 provides a good potential testing ground for the models - fairly stable temperatures (as could have been predicted from natural cycles) and a fairly linear trend in increasing levels of CO2. Models show a lot of net radiation which should have added to temperatures, but it hasn't. Absolutely none of the CO2 has had any effect whatsoever. Hence the models are wrong. There are solid reasons based on physics on my home page as to why CO2 does not have a net warming effect. It can also act as a scavenger, removing heat from O2 and N2 molecules and then emitting photons much more easily than those air molecules can do - thatis, CO2 can also (indirectly) cause cooling. It doesn't matter if GHG molecules get warmer - they will just emit more. And even the models say at least 99.7% of all emitted heat energy gets to space eventually. I say that the models cannot have such a high degree of accuracy, anyway, so it's not surprising that their 99.7 figure can easily be 100% or even greater when the world is cooling.